prednisone 5 mg 40 sig qd Emma enjoying her Smore’s dessert given to her by Yardhouse. She was so excited. click We have been very purposeful about really enjoying the last few months while Emma has been off of treatment because we have learned over the years that time off of treatment is a gift. Unfortunately we have also learned that these times away from treatment come to end. http://maientertainmentlaw.com/?search=generic-viagra-professional-from-canadian-pharmacy We have been very lucky the last few months to have scan results that were stable enough that we didn’t have to do anything and could just continue without treatment. We have both been worried the last few weeks because we knew in the back of minds that it was only a matter of time before the tumor grew again and we would have to start treatment. While we prayed that things would be stable, we also know that these good times come to end. cialis generico no brasil Emma’s scan results today showed that her tumor has grown. The main tumor grew about 3 mm, and it had also grown slightly the scan before, which means it has now grown close to 5 mm in the last six months. While Dr. Chi tells us the growth is not alarming, she does feel that we need to start treatment again because it over the past 6 months it is noticeable growth. The good news is that it hasn’t grown substantially, and that she looks really good clinically, but the growth is still enough that we need to do something. No matter how many times we do this, and no matter how much you tell yourself not to get your hopes up, it still feels like a kick in the gut. It is pretty heart breaking to hear your 6 year old tell people she got bad news today. source site Dr. Chi was very happy with how Emma presents clinically and is very happy to see that she doesn’t seem to by exhibiting symptoms from the growth. We spent a great deal of time discussing several different treatment options with her and weighing pros and cons of each. I think we have narrowed it down to the one we will try next, but we will still think on it for a few days and talk with our doctors in Omaha as well. The treatment we are looking at has been around for awhile and involves weekly infusions. Some of its side effects involve low blood counts and nausea, which is a little hard to think about dealing with again. Dr. Chi feels that we are not in a rush to start so we can take a few weeks to enjoy the rest of summer (and send Emma to camp CoHoLo) before we start. 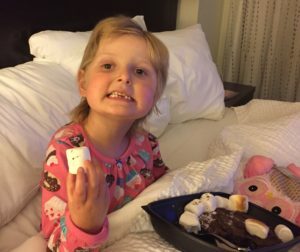 We are very appreciative for Dr. Chi taking so much time to discuss treatments, what is important to us, and what type of treatment will best fit into Emma’s life but still hopefully be effective. There are so many different things to consider with each treatment, it can be a bit overwhelming. comprare viagra generico 100 mg a Firenze Needless to say the news today is not at all what he had wanted to hear. Tonight we are all feeling pretty down. The thought of having to restart treatment and deal with everything that comes with it makes me want to just sit down and cry honestly. It makes me sad and mad that the happy life we were living will soon be filled with treatment and counts and balancing the rest of life with it. As we always do though, we will take our few days to be sad and mad, and then we will put on our strong faces and start fighting and getting ready for treatment. Just like every other time, we will do everything we have to for Emma and we will pray that this treatment will stop the tumor growth and that we can get her back to a place of stability so we can once again enjoy time away from treatment. http://cinziamazzamakeup.com/?x=comprare-vardenafil-Napoli We thank all of you for the prayers and encouraging messages today. They all mean so much to us and they help us to get through these tough days. Thank you for being EmmaStrong with us!